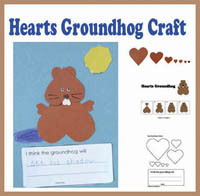 Preschool and Kindergarten Groundhog day crafts and activities. 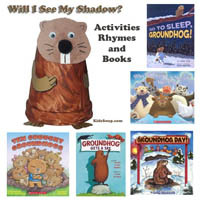 Groundhog's Day is celebrated in the USA on February 2 in Punxsutawney, Pennsylvania. 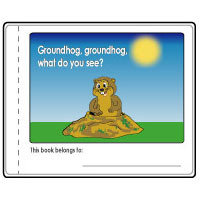 On February 2, it is believed that the groundhog comes out of his burrow. 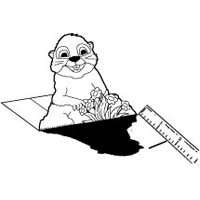 If the sun is shining and he sees his shadow, there will be six more weeks of winter weather. 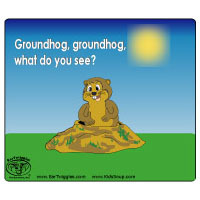 If it is cloudy and the groundhog cannot see his shadow, he will come out, and it is a sign of an early spring. 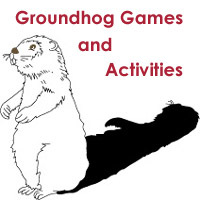 We created some great Groundhog's Day preschool and kindergarte activities, crafts, games, and lessons for you and your children to celebrate this fun event and we predict your child will have lots of fun! 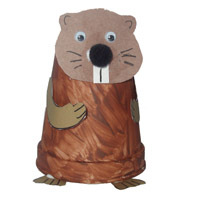 Print Groundhogs stick puppets printable and let children color them. Cut out the groundhog and glue it to the tip of a craft stick. Make a small hole in the bottom of the cup big enough to push the craft stick through. Cut a one-inch strip off a brown paper bag and snip small cuts into it. Glue to the inside rim of a Styrofoam cup. 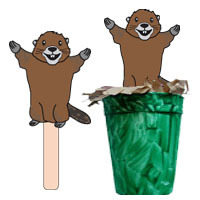 When dry, push the end of the stick groundhog through the bottom of the cup. 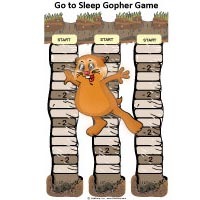 Move the stick up and down to make the groundhog peek out of its burrow. Six more weeks of winter? oh, no! That means winter six more weeks! 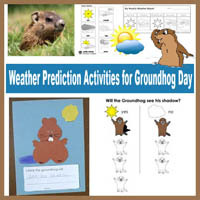 Lead a discussion and ask children if a groundhog really can predict the weather. 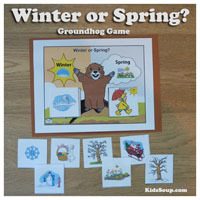 Make any of these groundhog weather prediction activities. 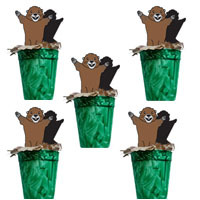 On February 2, Groundhog Day, let children bring a stuffed toy to school. 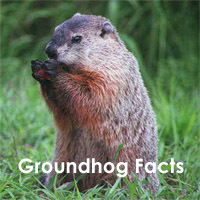 Explain to children that the name of the famous weather predicting groundhog is Punxsutawney Phil. Let children name their stuffed toy to something like San Diego Sam, Florida Fiona, Denver Dan, etc. 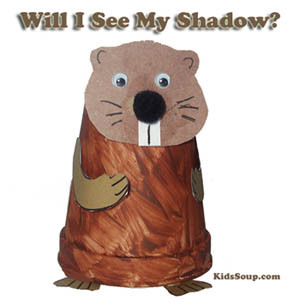 Let children predict if and when the "stuffed toys" will see their shadows. 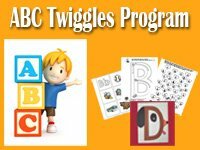 Place the stuffed toys outside. 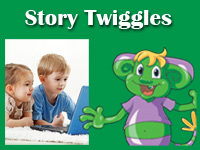 Together visit the "stuffed toys" to look for their shadows. 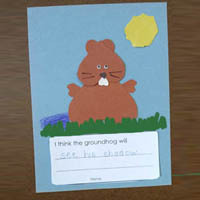 Discuss with children the weather and nature in winter and spring. What kind of clothes do we wear. 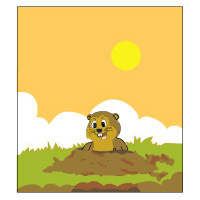 What happens in nature in the spring? In winter? etc. 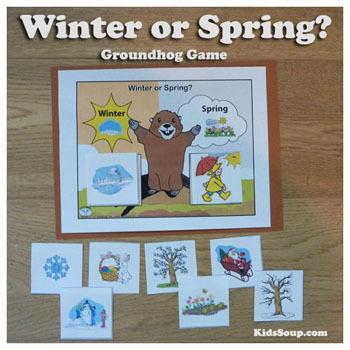 Let children sort different pictures to the correct season. If it's sunny outside and the body casts a shadow, play shadow tag. Instead of touching a person, whoever is It must step on someone's shadow. 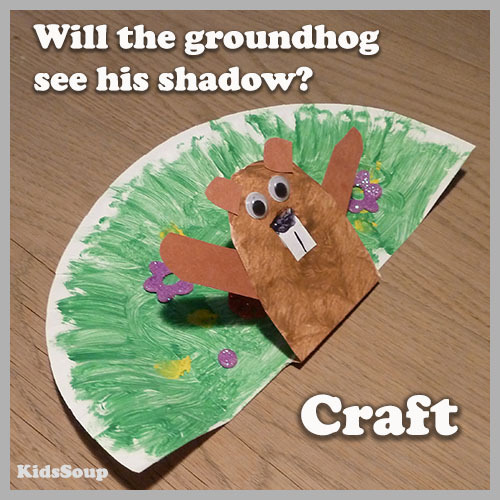 Allow children to experiment with what their shadow does before the drawing activity. One child "poses" while his or her partner traces the outline of the shadow on the pavement with a piece of sidewalk chalk. Tape white paper to the wall. 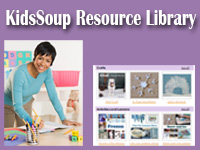 Have child sit on a chair in front of white paper. 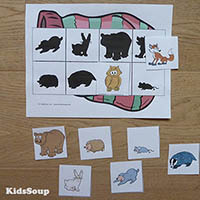 Shine the flashlight on the child so as to create a silhouette on the paper. Have another child trace the silhouette.